From the time my children were young, I learned the art of hiding healthy foods where they least expected it. Smoothies would be filled with flax seed oil and wheat germ, scrambled eggs hid zucchini and cheese and pancakes could hold all sorts of healthy ingredients! Sometimes, as a mom, you have to get creative with your kids’ nutrition! These pancakes hold all sorts of goodness and they are really easy to make. 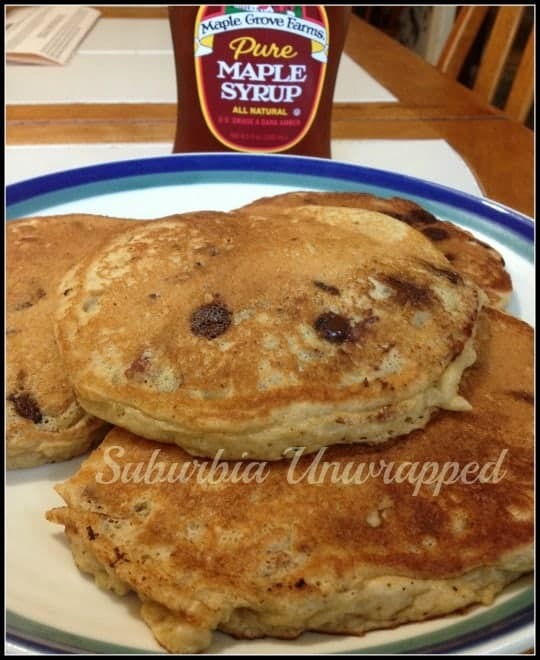 The recipe below will make lots of pancakes (we got 12 large pancakes)…I like leftovers and they warm up well in the toaster oven or microwave. No matter what, always splurge on real maple syrup! There is absolutely no comparison between the real stuff and that fake maple ‘flavored’ stuff. In a blender, put the eggs, yogurt, oil, bananas, and vanilla. Mix on medium speed until smooth and well blended. Heat a non stick griddle or greased frying pan to medium heat. Pour 1/2 cup at a time onto the pan and cook until the top is slightly bubbly and the bottom is lightly browned. Flip carefully and cook other side until golden. Remove to a plate and top with butter and maple syrup.